Some of the biggest nightmares of today include our precious gadgets being stolen or lost. And looking at the recent events looks like the same has come true for many. 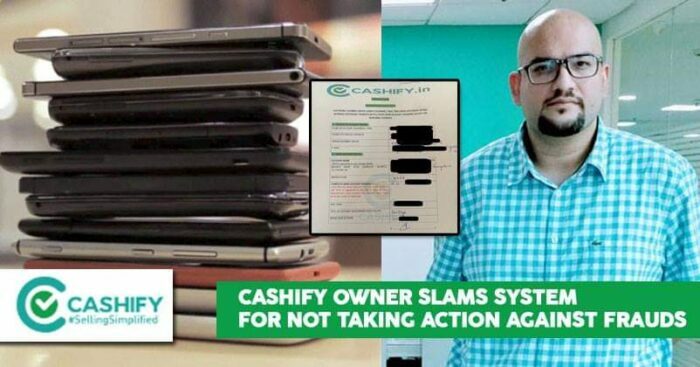 Cashify which is an online smartphone exchange startup came into light when multiple cases of frauds were reported by clients who sold their smartphones, Apple iPhones and watches to people who posed as Cashify personnel and were not paid in return. Commenting on the same Nakul Kumar, the founder of Cashiffy took to Twitter and shared his part of the story. “It all started with a complaint we received on 7th March from Bangalore where a customer had not been paid for selling his Apple Watch on Cashify. Note: Cashify doesn’t buy Apple Watches. Someone was clearly posing as Cashify,” he tweeted. He also shared how they asked for help from the police officials only to be let down with their response which finally led them to take matters into their own hands. They planned and laid a trap for the imposters and successfully managed to catch them only to left by the police after being handed over. Disappointed and angered with the inaction from the authority they later approached the Commissioner of Police, Bangalore and filed a complaint but claim to have had no luck yet. Nakul Kumar said, “So I guess I just want to ask all the tweeps here, what is too malign a crime to get registered? We had the proofs, we had the victims. What we didn’t have was the support of the custodians of law who’re supposed to use those to favour justice. SHAME!” he added. On this, the police commissioner finally reacted and said that all necessary actions will be taken.